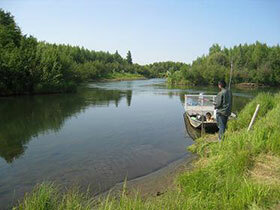 Rod and reel fishing location on a Kuskokwim tributary accessible by boat. There is no road access to the Kuskokwim River. Seasonal access is available by snowmobile, plane or boat.